The semester has begun and we are back to teaching calculus. 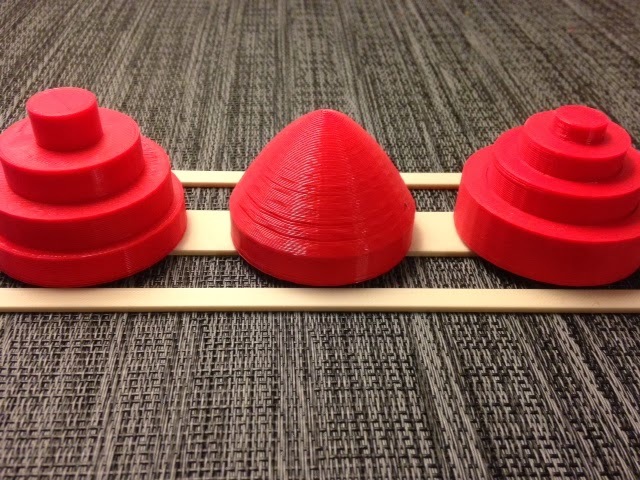 Later this semester we will cover Volumes of Solids of Revolution with the "disc method" and the "shell method", and when we do, we'll use today's print as a 3D example. This model was developed last summer in collaboration with RM and BL, the crack team of 3D Printing Lab Assistants who helped set up the JMU MakerLab. The design was meant to evoke the famous Towers of Hanoi puzzle, which you can play for yourself at SoftSchools. The center piece was exported from Mathematica, and the rest of the model was made in Tinkercad (which came back from a sleep today after a large update - so glad you are back, Tinkercad!). Settings: The model in the STL file above is very tight when printed on .3mm/low, but a fairly good fit at .15mm/high with MakerWare on a Replicator 2. I highly recommend doing partial test prints to test the clearances involved. 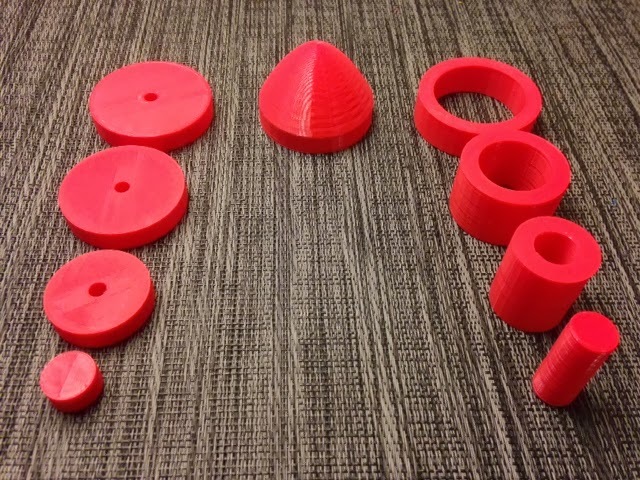 The leftmost set of pieces represents an approximation of volume of the center solid of revolution with four discs, and the rightmost set represents a different approximation of that solid with four shells. The discs each have the same height but their radii are determined by the function f(x). The shells each have the same thickness but their heights are determined by the function f(x). This particular solid of revolution and pair of approximations kicks off Section 7.2 of the book Taalman/Kohn Calculus (the best book! I am totally unbiased!). Stuff for the future: We are working on a customizable model, so stay tuned! UPDATE: Tinkercad posted a link to this model on their Facebook site on January 18: https://www.facebook.com/Tinkercad . We love you, Tinkercad!